When your Alaskan cruise ship pulls in to the port of Ketchikan, Alaska you have six to eight hours before it’s anchors up and you’re heading out to sea again, which is just enough time to find an adventure or two and make some memories of your short time in this small and beautiful Alaskan city. Soak up some history with a leisurely stroll along Creek Street, enjoy a bird’s eye view of the magnificent Alaskan landscape from a float plane, or explore the area by land and sea in the popular Ketchikan Duck tour. You will be surprised at what you can accomplish in a day while enjoying everything Ketchikan has to offer. 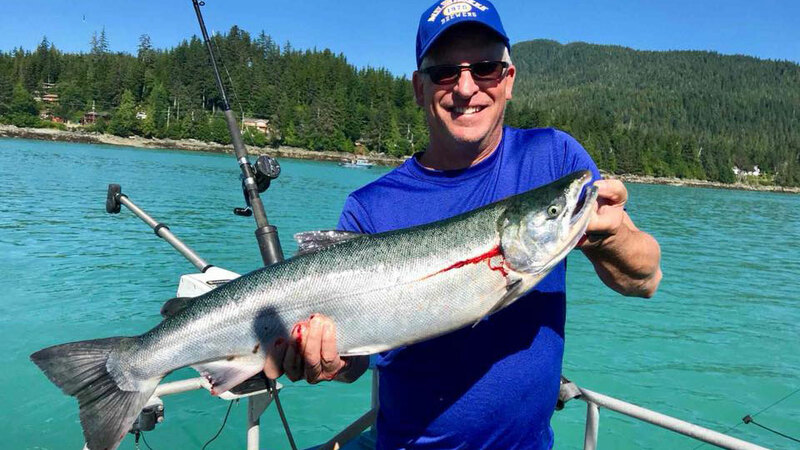 As a well-known and respected Ketchikan fishing charter, Alaska Strike Zone Sportfishing is naturally biased towards fishing as one of the best ways to experience Ketchikan, but we also know that our small town has lots more to offer its guests. 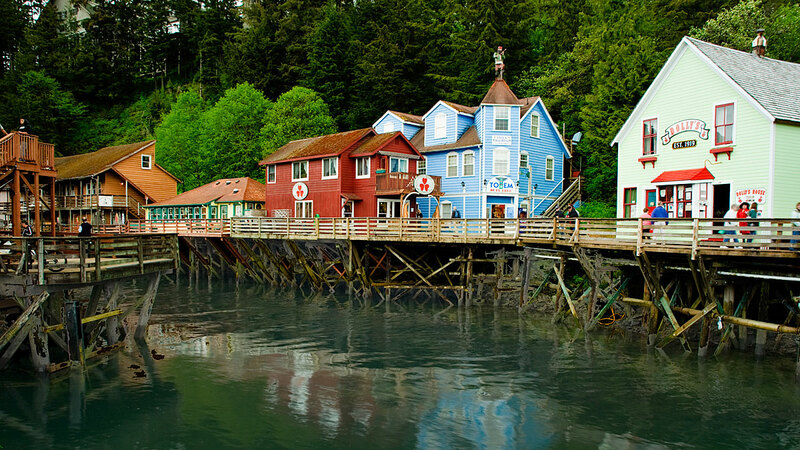 We want all of Ketchikan’s visitors to have a fantastic and memorable time, so without further ado here are a few top tours in Ketchikan that we think should not be missed. There’s no better way to soak up the Ketchikan culture than by taking a walk along the Creek Street Boardwalk. Along the way, you will be able to visit the Dolly’s House Museum, check out intricately carved totem poles, and browse and shop in the local stores. As you are strolling, be sure to keep an eye on the trees above and see if you can’t spot an eagle or two. The best thing about walking Creek Street is that it is self-paced and affordable. You can walk the entire street in just 20 minutes, but it is very easy to spend two hours or more exploring the local shops. If fishing is one of your favorite things to do, then you are in one of the world’s top spots for casting a line. Ketchikan is home to massive salmon runs and depending on when you visit you can try your luck at catching the elusive silver, tasty sockeye, or challenging yourself with the mighty king salmon. 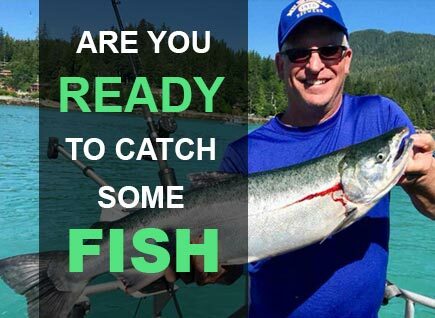 There’s fishing for every type of fisherman in the waters around Ketchikan as you can also choose to go after halibut, lingcod, red snapper, or Dolly Varden trout. Booking a fishing charter increases your chances at catching a fish because local guides have the expertise, equipment and knowledge of the local waters and fishing seasons. With half-day and full-day fishing excursions available, you’ll easily be able to fit world-class fishing into your visit to Ketchikan. Ready to go Fishing? Book Your Charter Today! 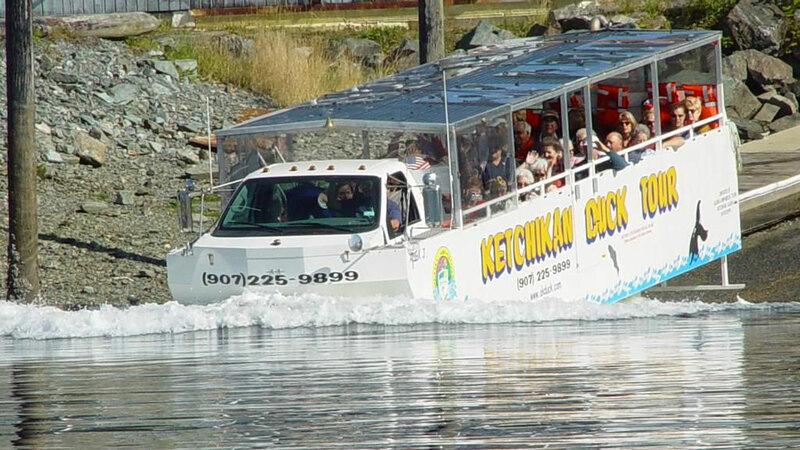 You can choose to experience Ketchikan by land or sea, but if you take the Ketchikan Duck Tour, you can experience the best of both worlds while laughing at the captain’s unique sense of humor as he tells you about life in Ketchikan. The Duck Tour takes a total time of an hour-and-a-half, which is the perfect length if you also want to get in a spot of fishing in during your time in Ketchikan. The first half of the tour takes you on a land-based sightseeing trip to visit many of Ketchikan’s most exciting locations. Along the way, you will see totem poles, Dolly’s House Museum, the Thomas Basin Marina and Ketchikan creek where you may see thousands of spawning salmon. Once the land-based part of the tour is over you will be splashing down into the largest marina in Ketchikan, the famous Bar Harbor. The harbor tour is by far one of the best shore excursions in Ketchikan, Alaska as it gives you a different perspective on Ketchikan as you take in the vast variety of fishing boats, and the varied wildlife which makes the harbor their home. There are so many ways to enjoy Ketchikan but taking a floatplane to the skies is one of the top tours in town and not to be missed. As you take in the magnificent vista, your knowledgeable pilot will be filling you in on important details about Ketchikan and its many unique locations. There’s nothing quite like spotting a brown bear foraging for fresh berries in the forest or spying a nimble-footed mountain goat resting on a ledge as you soar over the landscape. In the air is the best way to enjoy the views of pristine snow-capped mountains and virgin rainforest. Using the latest in headphone technology you won’t miss any of the significant details as the pilot fills you in on everything you are seeing. 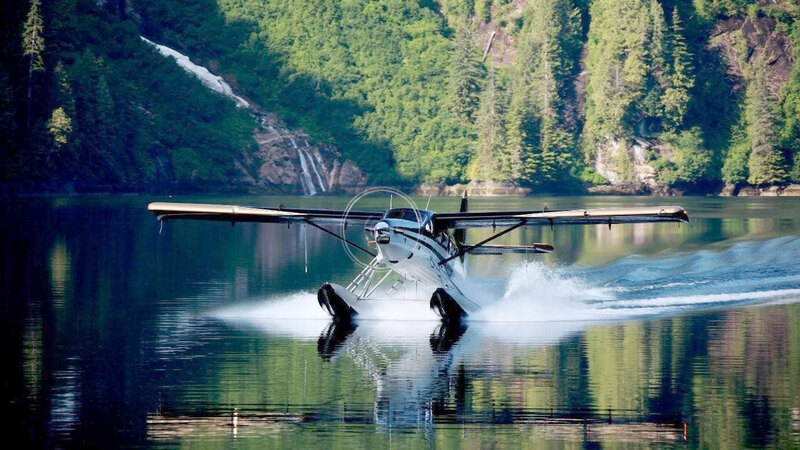 A highlight of an Alaskan flightseeing tour is when you glide into the Tongass Narrows on your way to the majestic mountain ranges, which make this area of the planet one of the most mesmerizing and unique places on earth. 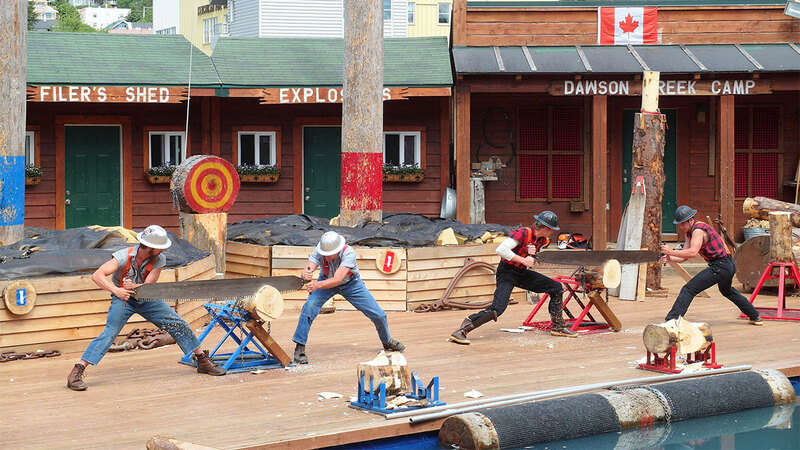 The Ketchikan Lumberjack show is an exciting event full of fun and laughter, and big men doing amazing things with axes in the spirit of friendly competition. If you’ve never witnessed the spectacle of Timber sports, then you are in for a treat. The contestants are all outfitted in period wear to add to the authenticity, and it’s not all about how well they can handle an ax in the speed chopping competition. Contestants will also have to shimmy up tall poles in the pole climbing race, cut through massive logs using a power saw, speed saw through logs as a team of two, and display deadly and accurate force in the ax throwing competition. Plus, the audience always gets a kick out of the log rolling competition, where each contestant desperately balances on a rolling log while at the same trying to spill the other into the drink. It’s a crowd favorite. Ketchikan has some of the most fun and exciting shore excursions available in Alaska. The combination of history, world class fishing and incredible natural beauty makes it easy for you to find the perfect tour for you and your travel companions.